The Native American story of Red Robe's Dream. Learn about the culture, stories, myths and legends of American Indians and their famous chiefs and tribes. A Native American Story of Red Robe's Dream to teach kids about Native Indians in a short, enjoyable, easy to read format. 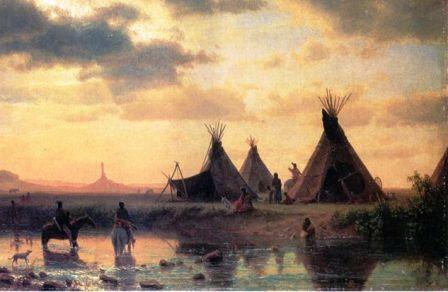 Long, long ago, Red Robe and Talking Rock were young men in the Blackfeet camp. In their childhood days and early youth their life had been hard. Talking Rock was an orphan without a single relation and Red Robe had only his old grandmother. This old woman, by hard work and sacrifice, had managed to rear the boys. She tanned robes for the hunters, made them moccasins worked with porcupine quills, and did everything she could to get a little food or worn out robes and hide, from which she made clothes for her boys. They never had new, brightly painted calf robes, like other children. They went barefoot in summer, and in winter their toes often showed through the worn out skin of their moccasins. They had no flesh. Their ribs could be counted beneath the skin; their cheeks were hollow; they looked always hungry. When they grew to be twelve or fifteen years old they began to do better, for now they could do more and more for themselves. They herded horses and performed small services for the wealthy men; then, too, they hunted and killed a little meat. Now, for their work, three or four dogs were given them, so with the two the old woman owned, they were able to pack their small lodge and other possessions when the camp moved, instead of carrying everything on their backs. Now they began to do their best to make life easier for the good old woman who had worked so hard to keep them from starving and freezing. Time passed. The boys grew old enough to go out and fast. They had their dreams. Each found his secret helper of mysterious power, and each became a warrior. Still they were very poor, compared with other young men of their age. They had bows, but only a few arrows. They were not able to pay some great medicine man to make shields for them. As yet they went to war only as servants. About this time Red Robe fell in love. In the camp was a beautiful girl named Ma-min'—the Wing—whom all the young men wished to marry, but perhaps Red Robe loved her more than all the rest. Her father was a rich old medicine man who never invited any except chiefs and great warriors to feast with him, and Red Robe seldom entered his lodge. He used to dress as well as he could, to braid his hair carefully, to paint his face nicely, and to stand for a long time near the lodge looking entreatingly at her as she came and went about her work, or fleshed a robe under the shelter of some travois over which a hide was spread. Then whenever they met, he thought the look she gave him in passing was friendly—perhaps more than that. Wherever Ma-min' went her mother or some woman of the family went with her, so Red Robe could never speak to her, but he was often near by. One day, when she was gathering wood for the lodge, and her companion was out of sight behind some willow bushes some distance away, Red Robe had a chance to tell Ma-min' what was in his heart. He walked up to her and took her hands in his, and she did not try to draw them away. He said to her, "I love you; I cannot remember a time when I saw you that my heart did not beat faster. I am poor, very poor, and it is useless to ask your father to let me marry you, for he will not consent; but there is another way, and if you love me, you will do what I ask. Let us go from here—far away. We will find some tribe that will be kind to us, and even if we fail in that we can live in some way. Now, if you love me, and I hope you do, you will come." "Ai," replied Ma-min', "I do love you; only you. All the other young men pass before me as shadows. I scarcely see them, but I cannot do what you ask. I cannot go away and leave my mother to mourn; she who loves me so well. Let us wait a little. Go to war. Do something great and brave. Then perhaps you will not uselessly ask my father to give me to you." In vain Red Robe tried to persuade the girl to do as he wished. She was kind; she threw her arms about him and kissed him and cried, but she would not run away to leave her mother to sorrow, to be beaten by her father, who would blame the poor woman for all the disgrace; and so, too soon, they parted, for they heard her companion coming—the sound of her heavy foot-steps. Three Bulls, chief of the camp, was a great man. He had a fierce temper, and when he spoke, people hurried to do what he ordered, for they feared him. He never talked loud nor called any one by an ill name. When any one displeased him or refused to do what he said he just smiled and then killed the person. He was brave. In battle with enemies he was the equal of twenty men, rushing here, there, into the thickest of the fights, and killing—always with that silent, terrible smile on his face. Because he was such a great warrior, and also because he was generous, helping the poor, feasting any who came to his lodge, he was the head chief of the Blackfeet. Three Bulls had several wives and many children, some of them grown and married. Gray hairs were now many in his head. His face wrinkles showed that old age was not far distant. No one supposed that he would ever take another wife; so when the news spread through the camp that he had asked the old medicine man for his daughter Ma-min', every one was surprised. When Red Robe heard the news his heart nearly broke. The old medicine man agreed to let the chief have the girl. He dared not refuse, nor did he wish to, for many good presents were to be given him in three days' time. When that was done, he told his daughter, she would be taken to the chief's lodge; let her prepare for the change. That day Red Robe had planned to start with a party to war; but when he, heard this news he asked his friend Talking Rock to take word to the leader that he had changed his mind and would not go. He asked his friend to stay with him, instead of joining the war party, and Talking Rock agreed to do so. Out in front of the camp was a large spring, and to that place Red Robe went and stood leaning against a large stone and looking sadly down into the blue water. Soon, as he had thought, Ma-min' came to the spring for a skin of water. He took her hands, as he had done before, and began to beg her to go away with him that very night, before it was too late. The girl cried bitterly, but at first she did not speak. The two were standing in plain sight of the camp and the people in it, and some one went to the chief's lodge and told him what was taking place. "Go to the spring," said the chief, "and tell that young man to let the girl go; she is to be my wife." The person did as he was told, but the two young people paid no attention to him. They did not care what any one said, nor if the whole camp saw them there together. All they could think about was this terrible thing, which would make them unhappy so long as they lived. Red Robe kept asking the girl to go, and at last she consented to do as he wished. They had their arms about each other, not thinking of the crowd that was watching them, and were quickly planning for their meeting and for their going away that night, when Three Bulls quietly walked up to them and stabbed the young man with a flint-pointed lance. Red Robe sank down dying at the young girl's feet, and she, looking down for an instant at her lover, turned and ran to her father's lodge. "Bring wood," the chief called out; "let every one bring some wood; all you have at your lodges. Those who have none, let them go quickly and bring some from the timber." All the people hurried to obey. What Three Bulls ordered was soon done, for the people feared him, and soon a great pile of wood was heaped beside the dead man. The chief lifted the slender young form, placed it on the pile of wood, and told a woman to bring coals and set fire to the pile. When this had been done, all left the place except Three Bulls, who stayed there, tending the fire and poking it here and there, until it was burnt out and no wood or trace of a human body was left. Nothing remained except the little pile of ashes. These he scattered. Still he was not satisfied. His medicine was strong; perhaps his dream had warned him. Now he ordered that the lodges be taken down, that everything be packed up, and that the trail of the moving camp should pass over the heap of ashes. Some time before this, after Red Robe had made his long fasting, and his dream had come to him and he had returned to his grand-mother's lodge, he had told his true friend something of what had been said to him by his dream. "If I should die," he said, "and you are near, do not desert me. Go to the place where I fell, and if my body should have been destroyed look carefully around the place. If you can find even a shred of my flesh or a bit of my bone, it will be well. So said my dream. Here are four arrows, which the dream told me to make. If you can find a bit of my body, flesh or bone, or even hair, cover it with a robe, and standing over it, shoot three arrows one after another up into the air, crying, as each one leaves the bow, 'Look out!' When you fit the fourth arrow on the bowstring and shoot it upward, cry, 'Look out, Red Robe, the arrow will strike you!' and as you say this, turn and run away from the place, not looking back as you go. If you do this, my friend, just as I have told you, I shall live again." As the camp moved, Three Bulls stood and watched it filing over the place of the fire, and saw the ashes scattered by the trailing ends of lodge poles and travois, and by the feet of hundreds of people and dogs. Still he was not satisfied, and for a long time after the last of the people had passed he remained there. Then he went on across the flat and up and over a ridge, but presently he returned, once, twice, four times, to the crest of the hill and looked back at the place where the camp had been; but at last he felt sure that no one remained at the place, and went on. Yet Talking Rock was there. He had been hidden in the brush all the time, watching the chief. Even after Three Bulls had passed over the ridge, he remained crouched in the bushes, and saw him come back again and again to peer over its crest. Still further on there was an-other higher ridge, and when the young man saw Three Bulls climb that and disappear on the trail of the camp, he came forth. Going to the place where his friend had lain, Talking Rock. sat down and mourned, wailing long and loud. Back on the hills the wolves and coyotes heard him and they too became sorrowful, adding their cries to his. The young man had little faith in the power of the four arrows that he kept so carefully wrapped in a separate bundle in his quiver. He looked at the place where Red Robe's body had been burnt. It was like any other place on the great trail that had been made, dust and grass blades mingled together, and scratches made by the dragging poles. It did not seem possible that anything of his friend's body remained; yet he must search, and breaking a green willow twig he began carefully to work over the dust, stopping his crying, for the tears blinded his eyes so that he could not see. All the long morning and far into the after-noon, Talking Rock swept the dust this way and that, turning it over and over, in a circle that grew always wider, and just as he was about to give up the search, he found a bit of charred and blackened bone. Was this a part of his friend's frame? Was it not more likely a bit of bone of buffalo or elk, which some dog had carried from one of the fireplaces of the camp and dropped here? Now for the test. Talking Rock covered the bit of bone with his robe as he had been told to do. He even raised the robe along its middle, making it look as if it really covered a person lying there. Then he shot three of the arrows up in the air, each time crying, "Look out." Then with a hand that trembled a little, he drew the fourth arrow from the quiver, shot it and cried, "Look out, Red Robe, the arrow will strike you"; and, turning, ran from the place with all his speed. How he wanted to look back! How he longed to see if his friend was really rising from that bit of blackened bone! But Talking Rock was strong-hearted. He controlled his desires. On and on he ran, and then—behind him the light tread of running feet, a firm hand gripped his shoulder, and a loved voice said, "Why so fast, my friend?" and stopping and turning, Talking Rock found himself face to face with Red Robe. He could not believe what he saw, and had to pinch himself and to hold his friend hard in his arms to believe that all this was real. The camp had not moved far, and the lodges were pitched on the next stream to the south. Soon after dark, the two friends entered it and went to their lodge. The poor old grandmother could not believe her eyes when she saw the young man she had reared and loved so dearly; but when he spoke she knew that it was he, and running over to him she held him in her arms and kissed him, crying from joy. After a little time, the young man said to her, "Grandmother, go to the chief's lodge and say to him that I, Red Robe, need some dried meat." The old woman hesitated at this strange request, but Red Robe said: "Go, do not fear him; Three Bulls is now the one to know fear." When the old woman entered the great lodge and in reply to the chief's look said, "Red Robe sent me here. He wants some dried meat," only Three Bulls of all who were in the lodge, showed no surprise. "It is what I expected," he said; "in spite of all my care he lives again, and I can do nothing." Turning to his wives he said, "Give her meat." "Did you see Ma-min'?" asked Red Robe, when his grandmother had returned with the meat and had told him what the chief had said. "No, she was not in the lodge, but two women were approaching as I left it. I think they were the girl and her mother." "Go back once more," said the young man, "and tell Three Bulls to send me that young woman." But now the poor old grandmother was afraid. "I dare not tell him that," she exclaimed. "He would kill me, and you. His anger would be fearful." "Do not fear," said Red Robe, "do not fear, my mother, his anger and his power are no longer to be feared. He is as feeble and as helpless as one of those old bulls one sees on the sunny side of the coulée, spending his last days before the wolves pull him down." The old woman went to the lodge and told the chief what Red Robe further wished. Ma-min' was there, her head covered with her robe, crying quietly, and Three Bulls told her to arise and go with the messenger. Timidly at first, and then with steps that broke into a run, Ma-min' hurried toward the lodge of her sweet-heart and entered it. With a cry of joy she threw herself into his arms, and Talking Rock went out and left them alone. Great now was the happiness of these young people. Long was their life, full of plenty and of great honor. Red Robe became a chief, respected and loved by all the people. Ma-min' bore him many children, who grew up to be the support of their old age. The Native American Indian Story of Red Robe's Dream provides an opportunity to read about the life and times of Native American Indians and many of their great chiefs and famous leaders. A Classic Short story about Red Robe's Dream for kids and children of all ages. This short story of Red Robe's Dream is great to read to kids and children at bedtime. This very short story contains folklore about the famous people of Native Indian tribes. This short Native American story has been selected to keep the attention of kids and children of all ages. Many of the traditional stories featured in this section are true and others are folk stories or myths and legends. Read our free short story online about Red Robe's Dream. Read a free, online short story about the people of famous tribes Native American Indians to increase knowledge and understanding of the indigenous people of North America. The Story of Red Robe's Dream. Discover the vast selection of pictures which relate to the Stories, History and Culture of Native Americans. The pictures show the clothing, War Paint, weapons and decorations of various Native Indian tribes that can be used as a really useful educational history resource for kids and children of all ages. 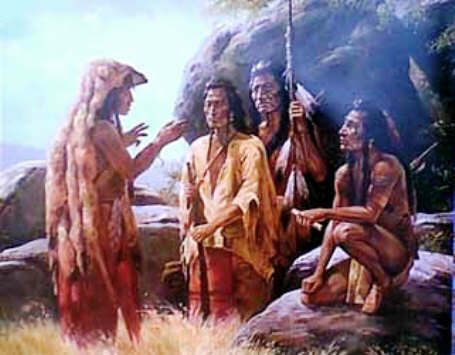 We have included pictures and videos to accompany the main topic of this section - The Native American story of Red Robe's Dream. The videos on this website enable fast access to the images, paintings and pictures together with information and many historical facts. All of the articles and pages can be accessed via the Native Indian Tribes Index - a great educational resource for kids.